This blogpost is an extract of an article published by World Vision on their website, and copied with permission. You can view the original article here. All photos are taken by Christian Ghafary. In Hadat, the busy and diverse Caza of Mount Lebanon, Fatmeh and Alaa, two veiled ladies walk into the church with Bchara, who is wearing the cross around his neck. Inside, Bchara starts to point at various elements of the church and explain them to the women. The eyes of Alaa, 18, are bursting with desire for learning. She maintains continuous eye contact with Bchara, a sign of active listening. Fatmeh, 18, too has many questions. With a friendly flicker in his eyes, Bchara answers: “By creating us, God put something from him in each and every one of us. If we do not meet and know each other, we cannot reach God”, he says. The discussion inside is accompanied by another outside the church between other members of the group; Mohamad, 17 and Jean Paul, 14. In his explanation, Jean Paul is pointing to his chest and the cross: “The cross represents the pain which Jesus went through for the sake of his children. We believe that Jesus did that for all of us.” The conversation ends with a friendly embrace. Before leaving, Mohamad says: “The differences in our religions will never separate us.” Afterwards, each group got taxi’s home to their own communities in different parts of Beirut. This was September 22, 2015, after a good-bye meeting these youth held as part of “The Feast”, an inter-faith project run by World Vision Lebanon (WVL) in partnership with the Institute of Middle East Studies and Lebanon Youth for Christ. The idea for this initiative in Lebanon is fully inspired by The Feast, an international NGO that supports work in numerous countries enabling young people of different faiths to form real friendships, grow in their understanding of each other’s and their own faiths and become peace-makers amongst their peers, their own communities and in the wider world. “When learning about the Feast, we thought that the youth of Lebanon are in need of such dialogue, and so we developed the Feast in Lebanon in 2013”, says Fady Hajj, Faith and Development Coordinator at WVL. After its success, WVL [with IMES and LYfC] decided to extend the Feast this year while widening the scope by targeting more faith groups. “This year we gathered four religious groups: Muslim Shiites, Muslim Sunnis, Christian Maronites, and Christian Evangelicals, and for the next years we aim for an even wider reach”, explains Hajj. The inter-faith discussions and activities started in February 2015 and lasted until September 22, 2015, the last day, where the youth met with World Vision Lebanon’s team, in a meeting room in the church of Hadat, to evaluate their eight-month journey. You can view the full article here. If you have any questions about anything in this article, do get in contact. The Feast is going strong in Lebanon. Faith is being discussed, friendships deepened and lives changed. Working with a slightly different approach, the same young people [about 32 on average] meet together every two weeks for an evening of discussion, challenge, fun and of course food. As with any Feast gathering, food is a critical component, and those of you who know anything about Lebanese cuisine, can imagine what a highlight this is!! The young people, all from the Beirut area of Lebanon, represent four distinct faith communities. Each community is represented by an existing youth group. The expectation is that, as a group, they will further influence their own communities. At each meeting we have Sunni and Shiite Muslim, along with Maronite and Evangelical young people. A couple of weeks ago we all went bowling and then had dinner together – we filled the entire (!) restaurant, which was fun [and noisy!]. The young people are always keen to talk about faith and religion. At times discussions have got a little heated, but given the part of the world in which we live that is not surprising – and the Guidelines for Dialogue are always there to help. The young people are really engaged in what they are doing and look forward to the next gathering. The month of Ramadan provides a great opportunity for us. Within the next few weeks we will be visiting the communities of the different youth groups participating in The Feast Lebanon. Each group will host a Feast gathering, and we will then share an Iftar meal together, to break the fast. We are in the process of looking ahead to the next year, and have some exciting ideas and plans. – Guest post, by Arthur Brown from The Feast Lebanon. MORE Youth Encounters in Lebanon… what next? The Feast Lebanon held its second day of activities with Muslim and Christian young people on Sunday 6th April in the city of Sidon. Sidon is mentioned a number of times in the Bible, and Jesus himself walked in the district of Tyre and Sidon [Matthew 15:21]. The day in Sidon served as an opportunity for the Muslim young people to return the hospitality they had received when they visited Beirut in March. What would you normally be doing this time on Sunday? What’s your primary identity? Lebanese? Muslim/Christian? Member of family? Something else? Why did God make us, for what purpose? What is the best thing about being a teenager? How do you pray? Why do you pray? What does prayer mean to you? When is it hard being Muslim or Christian? What is the most important influence on your spirituality? As you would expect, a key aspect of the day was lunchtime(! ), where the young people were able to deepen friendships that have been formed throughout the two days. We also shared the pictures the young people had shared on “The Feast in Lebanon” WhatsApp group. Prior to the day, each person was asked to share a photo that somehow represented them. On the day of the event, the young people explained the significance of their pictures. This was a great opportunity for us all to learn more about each other in a creative way. At the end of the day we asked each young person for their feedback on the events, how their views had changed, and what they would like to do next. The feedback was overwhelmingly positive. The young people really enjoyed getting to know each other and breaking down previously held stereotypes and misconceptions. They expressed the desire to talk more about the specific religions of the other group. They also wanted to have more time together, to include more young people and to do joint social activities with their new Christian/Muslim peers. These two days of The Feast in Lebanon were a pilot. As a result of the success of these two days, the facilitation team is now planning for how The Feast in Lebanon might develop in the future. We are all excited to see what could happen, and would appreciate your prayers. Lebanon undoubtedly is in need of creative interfaith youth work, in line with The Feast. In reality, the possibilities are almost endless. – Guest post, by Joel Taylor and Arthur Brown following World Vision and ABTS’s recent pilot encounter event in Beirut, Lebanon. Lebanon is usually in the news for all the wrong reasons. It is true that there is inter-religious conflict and tension, and yet at the same time there is also an incredible level of inter-faith engagement and understanding. And as usual, it is young people who may have the most to offer and the most to gain from building relationships of trust, understanding and hope with those from other faith traditions. 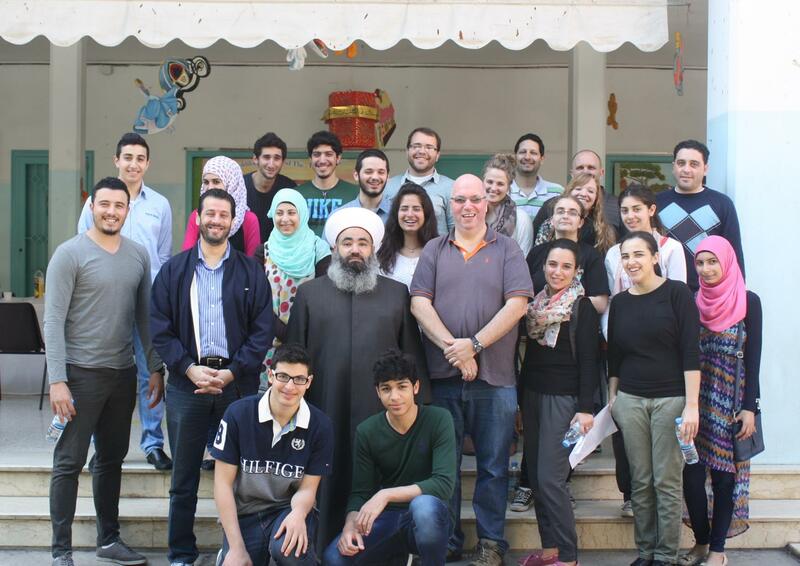 With this in mind World Vision Lebanon and the Institute of Middle East Studies [IMES] based at the Arab Baptist Theological Seminary [ABTS], Beirut, are facilitating a pilot ‘Feast’ project with 12 Lebanese young people, aged 15-18, which began on Saturday, the 8th of March, in Beirut. Although at this stage a pilot project, the purpose of The Feast in Lebanon is: To expose Lebanese young people (15-18), who are serious about their faith, to one another, in order to increase tolerance, understanding and cooperation. So far the 12 young people, six Sunni Muslims from the southern Port city of Sidon and six Evangelical Christians from Beirut, spent a day together doing a range of group activities, exploring how they would like to see their faith contribute to realising the future they wish to see for Lebanon. says IMES’s Arthur Brown. A second day is planned for the same group, this time in Sidon. Of course food was an important part of the day, and we all enjoyed an amazing feast of oriental food, prepared especially for the day. We are all looking forward to meeting up again and to seeing how The Feast could develop in Lebanon.